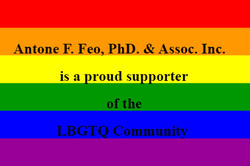 Transgender Therapy - Antone F. Feo, Ph.d & Associates, Inc.
Antone F. Feo, PhD. is a long time member of the World Professional Association for Transgender Health (WPATH). He and the Gender Team honor the standards of care presented by WPATH. We follow the standards of care so you receive the best quality service. The Gender Team has helped many M to F and F to M and their families go through their unique transition. Our Gender Team has the skills and knowledge to help you find an endocrinologist who can prescribe Hormone Replacement Therapy (HRT). We can assist you in legally changing your name. Rely on us to accurately complete the Bureau of Motor Vehicle forms for a gender marker change. Also, we can write the necessary letters for “top” and “bottom” surgery. Finally, when warranted we offer counseling to you and your family. Antone F. Feo, PhD. and the Gender Team have worked with transgender children as young as 6 years of age. When a parent brings their transgender child into therapy we offer therapy, education, and a safe place to explore options. Our Team can work with your child’s school and address any issues that may arise. Antone F. Feo, PhD. and the Gender Team are available for speaking engagements to any local organization or business. Dr. Feo has been a guest speaker on transgender issues at The Ohio Psychological Association, The Cleveland Psychological Associates, and has consulted with other counselors and therapists on transgender issues.